Check out Fox 2's article about AmeriCorps St. Louis's sandbagging efforts. by Sarah Wood Our crew of five sat in a circle in the sun, enjoying our lunch break on the Ted Jones Trail. We had spent the morning felling hazard trees from the side of the path, ensuring the safety of pedestrians and preventing future clean up by park staff. As we chatted and snacked, an elderly man approached our group. Other walkers on the trail had asked about our work or our organization, but this man had alternative commentary. "I never seen a woman on a tree crew before!" I looked at the other woman on our team and smiled at the man. "Well, there are two of us!" "Do you own the company or something?" He couldn't believe that two women could use chainsaws, and we proved otherwise. It's nice to know that in addition to removing invasive species and snags, AmeriCorps St. Louis is also removing something else: stereotypes. by Carrie Stephen In ERT, we serve on a lot of very important projects. But often times, we give our time and work hard, but we don't necessarily get to see the benefits or results of what we have done. We may build a fireline, but never see the burn. Or we may burn an area, but the results take many years to see. We may restore a glade, and although we can see the canopy open up, we don't necessarily get to see the grasses slowly come back. We may spray invasives encroaching along the highways, but unless you are sent back to the next zone the following year, you don't usually get to see them disappear. This past month, my team worked on woodland restoration in Forest Park, which does give a bit of a peak into results. As we thin the forest, the floor slowly lets more light in, and it's easy to see the difference. Although the grasses and wildflowers will take longer to return, it's good to know they will have what they need. Even more satisfying than watching this canopy open up to the sky, we spent a few days installing some check dams at a site that was experiencing some heavy water erosion during rainfall. We worked very hard the first two days, as there was a storm predicted for that week. We didn't finish installing all of our check dams before the storm hit, but we installed enough that we could see how they had faired in the weather. 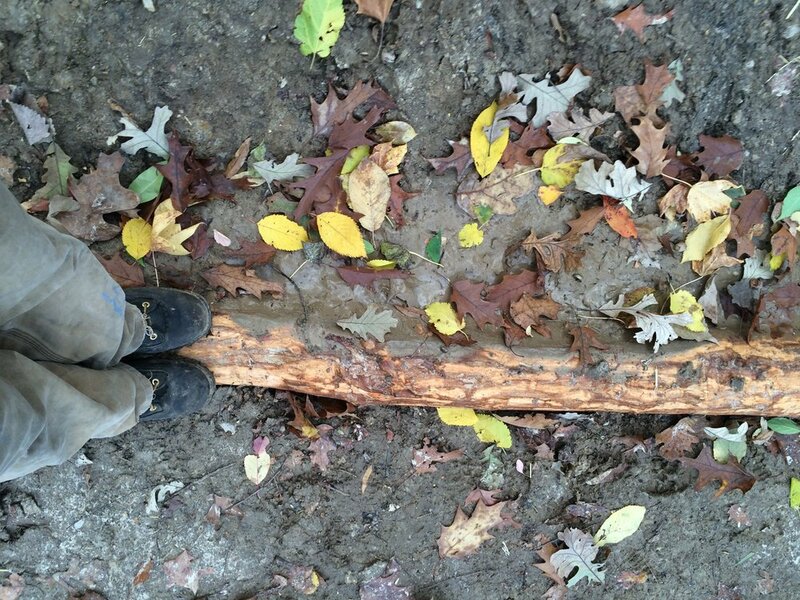 The day after the storm, we wandered up the hill, and behold, there behind our logs set in the ground, we could see sediment that had settled instead of washing down. One of the check dams even had a pool of water behind it, demonstrating for us that the water did slow down enough to keep the erosion at bay. It was a pretty exciting day, and with the knowledge that our hard work was paying off, we eagerly installed the remaining check dams. The finished result? A beauty to behold. by Brittany Merriman The day had finally come: our first disaster team was set to leave from headquarters on a month-long deployment. As I stood in the large office, watching those who were to be left behind give the departing team exuberant well-wishes, I thought of how far we'd come: a group of young adults who were by and large complete strangers less than 3 months ago were now saying goodbye to each other the way old friends often do. Contrasted with the slightly awkward yet puppy-sincere greetings we had given each other the first days we'd met, the current heart-felt goodbyes going on around me was even more notable. One team leader presented the leaving group with a loaf of homemade bread, and jokes were made about holiday care-packages ("We're sending you turkey and cranberry MRE's and nothing else" and "I swear I'll include at least two bags of peppermint patties, you fiend!"). The sincerity of the hugs exchanged was heartening. I myself happily chimed in a few "You're going to do wonderfully" and "Please don't forget to send me updates!" to my newest set of friends, and all around the room the sentiments were echoed independently and without irony. What struck me the most, however, was that although we were undoubtedly parting ways with friends, the atmosphere was not sad, but far from it: the room had the encouraging feeling of friends building each other up before a grand adventure. As the team was given a final wave-off, I thought that certainly the short span of time in which our friendships had been forged and the brightness with which they burned meant that this team had become more than simple friends: the months of living, working, playing, and learning together had made us nothing less than a family. by Amital Orzech My month started with spraying chemicals on the side of obscure highways in South East Missouri. The highlight being when we found an enormous patch of knapweed and were able to empty all three gallons of chemical we each carried on our backs onto the invasive plants. Our team’s project objective changed when we were asked to go to South Carolina to help out with disaster recovery in response to the flooding that occurred in October. We went into the project understanding that it would be a lot of office work; however we didn’t know exactly what we would be doing until we arrived at the Joint Field Office (JFO) in South Carolina. After Bruce wrangled our way through Security and got us approval to even be in the building, we were immediately put to work taking over the jobs of a FEMACorps team that was on their way out of the JFO. We took an idea they called Fast Track and within the course of one week turned their idea into a full-fledged process that utilizes an online database, Crisis Cleanup, to identify damaged homes and connect homeowners in need of repairs with volunteer agencies who are able to make them. Within the course of two weeks we have managed to contact major players in disaster recovery such as Red Cross and Salvation Army, who have agreed to work with us on Fast Track and are already sending us case referrals to add to the online database. What I’ve liked about this project so far is that it seems to embody what we in ERT are taught from day one of orientation: that a disaster begins and ends within the community. This process, Fast Track, allows home damage reports to be logged on Crisis Cleanup by volunteer agencies within the community, and the cases are then adopted by organizations that have the ability to make the repairs. Moving forward, the challenge will be getting the volunteer agencies to adopt cases and start making repairs as we get closer to winter and the temperature drops. Hopefully as our team continues to make connections within the counties, these ‘adoptions’ will start to pick up. It’s been pretty incredible, talking to people within the community who have been affected by the flood. Whether a person has been on the receiving end or the providing end of aid, everyone seems to be tirelessly invested in the recovery process. This month I got to return to Joplin for the one year anniversary of the tornado. Being in the AmeriCorps Recovery Center, seeing the destruction and talking to homeowners again brought back all the stress and frustration and all the sadness that I knew in my two months serving in Joplin. I was also reminded of all the joys, the thrill of accomplishment, and the gratitude that I felt working for storm-affected residents. The strength of these emotions surprised me as they all came flooding back. During my time in Joplin, I plowed through my work every day, oftentimes putting in long hours in the office working on tedious tasks or doing physical labor out in the field. I ended each day exhausted. There was little time for reflection or sentimentality. Returning months after I served in Joplin gave me space and perspective to reflect. I re-experienced the sorrow of hearing homeowner’s stories of their losses, the satisfaction of planting a healthy, beautiful tree in a homeowner’s yard, and the humility of seeing the strength and dedication of the volunteers we work with. I cried when people cheered AmeriCorps as we walked through the streets of Joplin. I knew I had put in the hours, and I knew I had put in the effort, but until returning to Joplin, I didn’t realize how much of my heart I had invested. I fell in love with Joplin. One year after the storm, and four months after leaving, Joplin is still in my heart every day. Support disaster recovery in Joplin and other affected communities by donating to AmeriCorps St. Louis. February 29th, 2012 was a day of destruction in Southwest Missouri. Tornadoes ripped through the area leaving hundreds of families with severely damaged or destroyed homes. The AmeriCorps St. Louis Emergency Response Team was called into action by the State Emergency Management Agency (SEMA) to provide volunteer management to both Stone and Taney county. Being a State resource for volunteer and donations management with in a disaster response, the Emergency Response Team quickly mobilized and had two separate Volunteer Reception Centers operational by the morning of March 1, 2012. Being the first disaster response for many of the Year 18 members, the Leap-Year Tornado has left an large imprint on their AmeriCorps service. As a Volunteer Coordinator in Stone County, Sara Levine,Yr 18 saw first hand the spirit of volunteers. "It was amazing for me to meet so many people willing to do whatever they can to help. It was even more amazing when people who were affected by the tornado still came in to help other people." Steven Lawson, Yr 18, took the role of Homeowner Coordinator for the Stone County Tornado Response gaining a new set of skills and understandings about both disaster response and volunteer coordination. "We arrived, got some of our equipment moved into the vacant super market that would become our VRC, and very soon after volunteers starting pouring in looking for information on how to help and projects they could be sent out to. It was a hectic first few days, but we got set up and obtained more information about the area, the damage, the people, and the community in general things started going more smoothly. I have always been someone out in the field doing manual labor and have never had a job which involved any type of office work. So the forms and the processing of information was really interesting to see and learn about. Especially since I’ve been involved in volunteer work and never really knew how much it took to ensure that volunteers were properly coordinated to projects so the goal, in this case initial cleanup, could be reached. I was able to be there from the first day to the last day that the VRCwas open, so to see things from start to finish was also a unique experience. We definitely got a lot done and even as much as I had wanted to get out in the field every once in a while, I feel very grateful to be able to better understand this essential component of disaster response. After this experience in Kimberling City, I feel much more confident in my abilities to work efficiently and effectively as a part of a VRC team and without this program I do not believe I would have had the opportunity to do such meaningful work while learning and continually challenging myself." Sam Zytka, Yr 18 describes working with a disaster affected family in Stone County, "Within two days we had fully restored hope to the elderly couple and made their situation much more bearable. As we were concluding the day and closing up the file on their house, the homeowner, with tears in her eyes, gave me a hug to thank me for all the work we had done. Easily the most rewarding experience I've had in AmeriCorps thus far." Jena Hood, Yr 18 tells a story of a woman in her early 70's that survived the Branson Tornado while living in a Long Term Motel on the Branson Strip. "My first disaster with AmeriCorps was definitely an eye-opener for me. The resiliency that the community in Branson portrayed following the Leap Year tornado was extraordinary. The motel suffered irreparable damage and was deemed condemned. Residents were told they would not be allowed to return to gather their belongings because it would be too dangerous to allow people inside the structure. [The woman] however, did not heed the warning. She told the story of how she basically “snuck” into the motel in order to retrieve at least some of her more personal effects. Fortunately, she escaped unscathed. [Her] spirit never faltered, despite having had her home totally destroyed, losing many of her belongings, and being displaced for several days (she had to reside in an emergency shelter until she found an apartment). Words cannot express the energy and charisma that this woman portrayed. She truly represented the resiliency that the community as a whole exhibited after this disaster." Stephanie Lee, Yr 18 , reflects on the big picture after the Leap- Year Tornado in Branson. "Sometimes in the hustle and bustle of the AmeriCorps lifestyle, you forget to look at the bigger picture--the reason you joined the program. With the nature of the program being so day-to-day, minute-by-minute, there isn't a lot of time for the events of each day to sink into your psyche. There are those events however that imprint on your mind and hold a forever place in your heart. The first day I was there I scouted homes that were damaged and talked with the homeowners about their needs. I also observed how the Volunteer Reception Center is run and how vital AmeriCorps St. Louis is to the disaster relief effort. I was so impressed with how competent our ERT team was in the Volunteer Reception Center and the Multi Agency Resource Center. It moved me to see such a combined and committed effort from my fellow team members, whom I've never had the opportunity of seeing in a disaster environment before. It made me so proud to be a part of such a vital disaster relief effort."